318 pages | 44 B/W Illus. For the past decade European countries have undergone a severe economic crisis, with severe consequences both for individuals and for governments. Unemployment and rising poverty have compelled individuals to reconsider their own priorities and goals, while governments have been forced to rethink social policies on the national level, as well as their international economic and political agreements. Some countries have been more deeply affected by the crisis than others, and the impact of economic shortage on individuals and governments has differed, not only because of the different magnitudes of the crisis, but also because individuals react differently to the contextual changes. how particular political and economic contexts produce changes in political orientations. 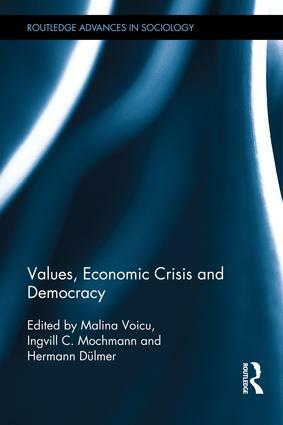 This book focuses on the interrelationship of social values, attitudes and economic scarcity in the context of the last economic crisis experienced by many European countries. It will appeal to scholars and students of sociology, political science and economics. Malina Voicu has a PhD in Sociology and works at GESIS Leibniz Institute for the Social Sciences. Her main research interests deal with social values and attitudes in the area of religion, political and family life. She is secretary of the Executive Committee and of the Theory Group of the European Values Study. Ingvill C. Mochmann is head of the EUROLAB at GESIS-Leibniz Institute for the Social Sciences and Vice President for Research and Professor of International Politics at the Cologne Business School. Her research interests include democracy and minority rights and research methodology. Hermann Dülmer is Assistant Professor (Private Lecturer) of Sociology at the University of Cologne. His substantive research interests focus on comparative value research, including value change and cultural change, and on electoral research with a particular emphasis on right-wing extremism. His methodological interests focus on multilevel analysis and on factorials surveys.